Having high cholesterol means that you need to watch what you eat. If you have this condition, your doctor has probably made this very clear. It's also likely that she was less clear about exactly what you're allowed to take in on a daily basis. Peanut butter -- a food that is oily, yet made from ostensibly heart-healthy plants -- is one food that can be particularly confusing from a cholesterol standpoint. When health professionals talk about high cholesterol, they are referring either to your LDL count or your total cholesterol count. LDL cholesterol is the "bad cholesterol," the type that clumps in your bloodstream and threatens your circulatory health. Total cholesterol is a number that accounts for your content of LDL and of heart-healthy HDL cholesterol by subtracting your HDL count from your LDL count. High scores in either LDL or total cholesterol indicate a high risk of heart disease, heart attack and stroke. Peanut butter needs no introduction for westerners. You likely grew up eating it in sandwiches, on toast and baked into cookies. Peanut butter is made by grinding peanuts into a creamy paste. Commercial peanut butter often includes added salt, sugar, preservatives and colorants. According to the USDA, a typical 2-tablespoon serving of peanut butter has 3.3 grams of saturated fats and 12 grams of unsaturated fats. Your body produces harmful LDL cholesterol in response to your intake of saturated fats, and produces HDL cholesterol in response to the presence of unsaturated fats. Since it contains high levels of both fats, peanut butter will stimulate your body to produce both kinds of cholesterol. It's worth noting that a serving of peanut butter contains just one gram of unhealthy saturated fat for every 4 grams of beneficial unsaturated fat. Peanut butter in small amounts can stimulate your body to produce the HDL cholesterol that clean LDL out of your bloodstream and reduce your cholesterol. However, the saturated fats in peanut butter mean your body will simultaneously produce harmful LDL as well. 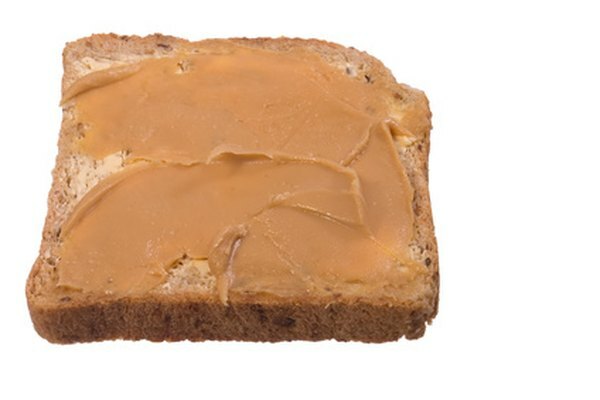 Health organization Kaiser Permanente advises that people with high blood pressure can eat peanut butter, but are better off eating it in small amounts.